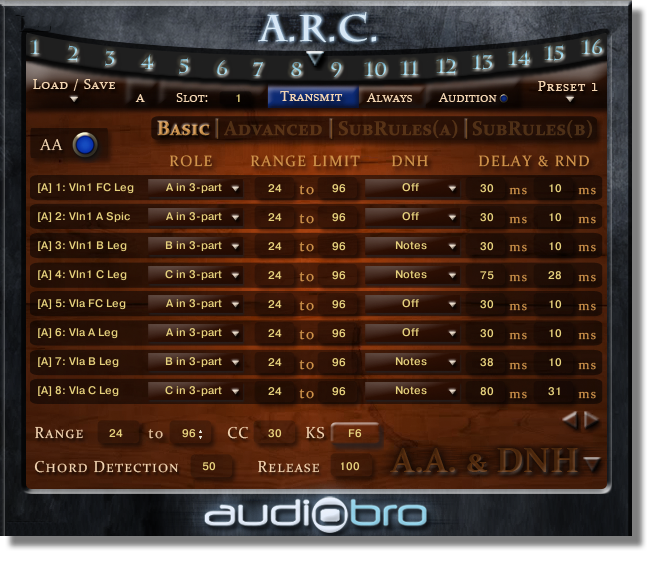 The Auto Arranger (AA) is a feature exclusive to LA Scoring Strings that allows you to play polyphonic legato lines, chords and phrases while splitting your chords into divisi sections or different instruments sections (if you prefer) and maintaining an accurate player count… as opposed to having the typical cumulative player count on chords as with other stringed sample libraries. This “auto divisi” feature can be a HUGE time-saver as well as a VERY inspirational composing tool. The Auto Arranger easily tracks the voices and splits them into divisi parts while retaining all the legato/portamento/glissando articulations. The Delay and Humanization (DNH) adds timing variations to each of the different divisi sections so they sound more natural when being played together. Also, you can be very literal if you’d like by applying laws of physics to the various patches. For example, if you’d like to assign one of the divisi sections to the “back rows” of players in their section, you might add 1 millisecond of delay per every foot they are away from the “front row” players — so perhaps 20 ms of delay (at sea level, sound travels approximately 1 foot/ms). All of these settings can be easily assigned to any number of patches at the same time… making it very easy and fast to create your own AA and DNH settings.